The More You’re Served, The More You Eat. Whether you want it or not, portion sizes in restaurants and homes are getting larger because that’s what people want. “Value sizing” (getting a bang for your buck) is a major contributor to the obesity epidemic and other chronic health conditions. 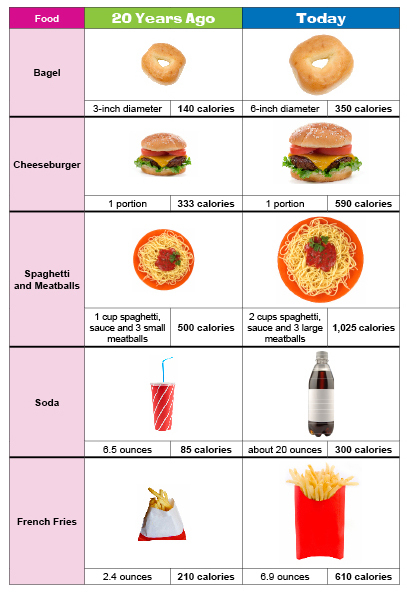 The Journal of the American Medical Association (JAMA) has found that, “since the 1970s, caloric intake has increased by 200 to 600 calories per person per day.” Back in the 1950s, McDonald’s French fries were only offered in what is today’s size small. Oh the good ole days. 1. Split an entrée so you’re not tempted into eating excess calories. 2. Portion your food on a plate and put the rest away to reduce the temptation to go back for more servings. 3. Don’t starve yourself in preparation for an upcoming meal. Eat small snacks throughout the day so you don’t overeat when dinnertime comes. 4. Understand how to read a food label. Just because the bag looks “individual” doesn’t mean it’s one serving! Take this portion distortion quiz from the NIH to see if you know how today’s portions compare to portions 20 years ago!